A few weeks ago I posted these Sweet and Salty Caramel Brownies (which are pretty much Snickers brownies), and they’ve already been in heavy rotation. Every cookout, every play date, every everything, for the past few weeks has included me toting a tray of the brownies around with me. Since the chocolate, salted caramel, and nuts were so darn popular, I decided to make a Baked Snickers Doughnut. A few weeks ago I was on Instagram (Which, by the way, I’m officially now on, so if you aren’t already following me, you can by clicking here.) I came across a photo of a Snickers Doughnut. It looked so good, but the user who uploaded the photo, gave zero info on the sweet treat. So, the resourceful baker that I am, I came up with my own version, and here you have it a Baked Snickers Doughnut. If you follow along at The Crafting Foodie, you know how much we love fried doughnuts. These Apple Pie Jelly Doughnuts and Nutella Stuffed Doughnuts are just two examples of my love for fried circles of dough. But, for this treat, I decided to bake the doughnut instead. Before you jump to any conclusions about the inferiority of my Baked Snickers Doughnut, hold up just one minute. While it’s not fried, it’s still a fluffy, moist doughnut with a crunchy exterior. These beauties are made with a fluffy, light, moist vanilla cake doughnut base. Then it’s dunked in some chocolate ganache. The ganache it topped off with another dip into homemade salted caramel. 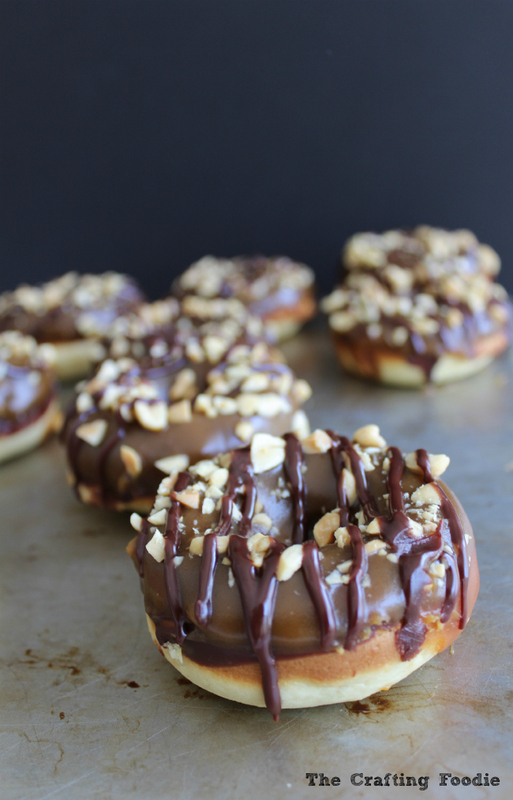 While the caramel is still fresh, the Baked Snickers Doughnut is sprinkled with a generous amount of chopped, salted peanuts, and drizzled with more chocolate ganache. After eating one of these, Mr. Crafting Foodie marveled that they actually taste just like a Snickers bar. And that my friends, was the ultimate compliment! Fluffy, vanilla doughnuts are dipped in chocolate, enrobed in salted caramel, sprinkled with crushed peanuts and drizzled with more chocolate! In a heavy bottomed-saucepan, add the sugar. Allow the sugar to cook over medium heat, until it turns a dark, amber. Remove the sugar from the heat and add the butter and allow it to melt. Then add the cream. It will bubble, so add it carefully. Transfer the caramel to a separate container and allow it to cool. Grease a doughnut pan with baking spray. In a large bowl, combine the oil and butter. Slowly add the sugar. Mix until combined. Add the vanilla and eggs. Mix until combined. Add the dry ingredients and milk in three different additions, alternating between the two. Starting and ending with the flour. Place the batter into a gallon-size tip top bag. Cut the corner of the bag. Pipe the batter into each doughnut mold. Fill about ⅔ full. Allow the doughnuts to cool for about 10 minutes, then turn them out on to a cooling rack to cool completely. In a heavy-bottomed pan, place the cream. Bring the cream to a simmer. Place the chopped chocolate into the cream. Cover the pot with an airtight lid. Allow it to stand for 5 minutes without disturbing. After 5 minutes, mix the chocolate and cream until the ganache is smooth and shiny. 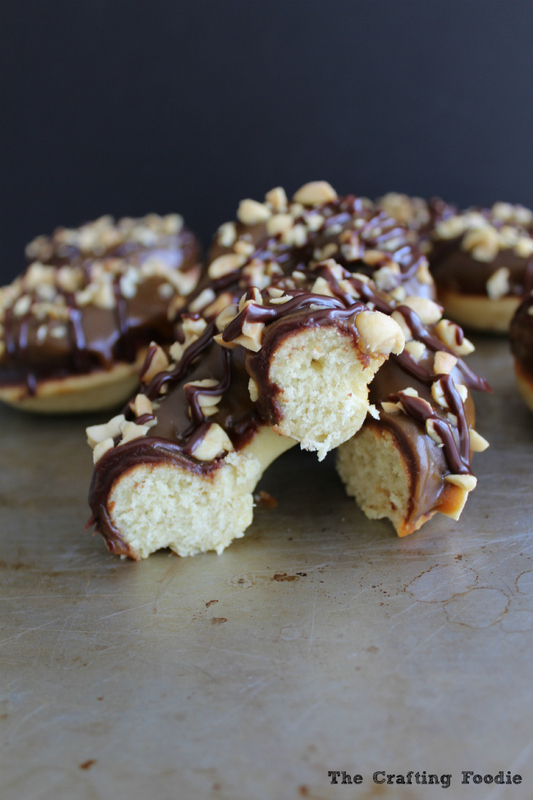 Dip the top of each doughnut in the chocolate ganache. Place the chocolate topped doughnuts in the fridge to cool for about 15 minutes. Dip the chocolate covered doughnuts into the salted caramel. Sprinkle the doughnuts with chopped peanuts. Place the extra ganache in a zip-top bag. Snip the corner of the bag. 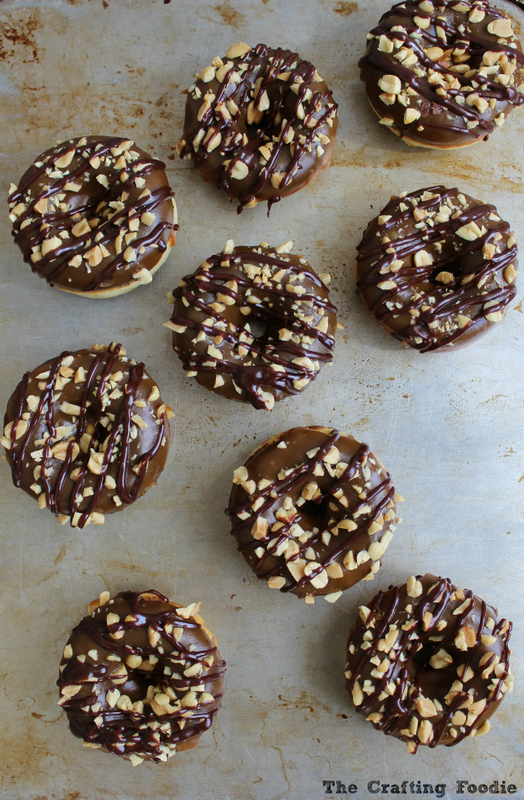 Drizzle the doughnuts with the chocolate. So great to hear from you Tonya! I’m so happy to make your day 🙂 My husband just saw the post, and he was reminiscing how much he loved these! These look amazing! I love baked doughnuts and these are just perfect! Believe it or not, I am NOT a fan of fried donuts, but baked donuts that taste like a snickers bar–well, sign me up! I believe it Kristen! I worked with someone who didn’t like any fried food, so now I’ll believe anything when it comes to fried food 🙂 And, yes, these actually taste like a Snickers Bar, and I’m just like you – I’ll take a Snickers in any form! Oh, what I wouldn’t give for one of these this morning instead of my plain boring oatmeal!!! Thanks, Ally! I hear you girl – sometimes the usual can’t compete with chocolate and salted caramel! These are positively sinful! Wow Aida you really hit it out of the park with this recipe! Thanks so much Allie 🙂 Yes, these aren’t for doughnut purists. It’s made for decadence and over-the-top deliciousness! Since I’m not a fan of frying, I’m a huge fan of these doughnuts. Can’t wait to try them! Thanks so much Carla! I promise that you won’t be disappointed! Question regarding the doughnut pan. Half of these turn out brown and the other half white….I noticed you frosted the dark side and I tend to frost the white side….is there a rule for this. Your frosting looks delicious…could you share if this hardens or does it tend to stay soft and a bit messy to eat? Keep up your great recipe sharing. Thanks so much for the great questions. You are right, the doughnuts definitely come out with one side substantially lighter than the other. I chose to frost the dark side because I felt like the browner side with a firmer crust, would hold up better to the gooey toppings better than the softer, lighter side. The toppings never completely harden – especially not the caramel. They are deliciously messy! Oh, and thanks for the kind words about my recipes. Cooking and baking are my passion, and I love sharing it with my readers, like you! Definitely, Enza. You could make the complete doughnuts – toppings and all, the night before. It won’t compromise them in any way. If you want to make them even more ahead of time, I would make the doughnuts, unfrosted. Once they’re completely cool, I’d stick them in a zip-top freezer bag, and freeze them. I’d let them defrost in the fridge over night. Then put the toppings on the night before serving. I hope that helps! These doughnuts are beyond amazing! Thanks for linking up with What’s Cookin’ Wednesday! Thanks so much Catherine! Baked doughnuts can be a bit boring, but these are jam packed with so many great flavors. I hope you give them a try! Gorgeous donuts, Aida. So decadent, and now I will be craving them all day long. 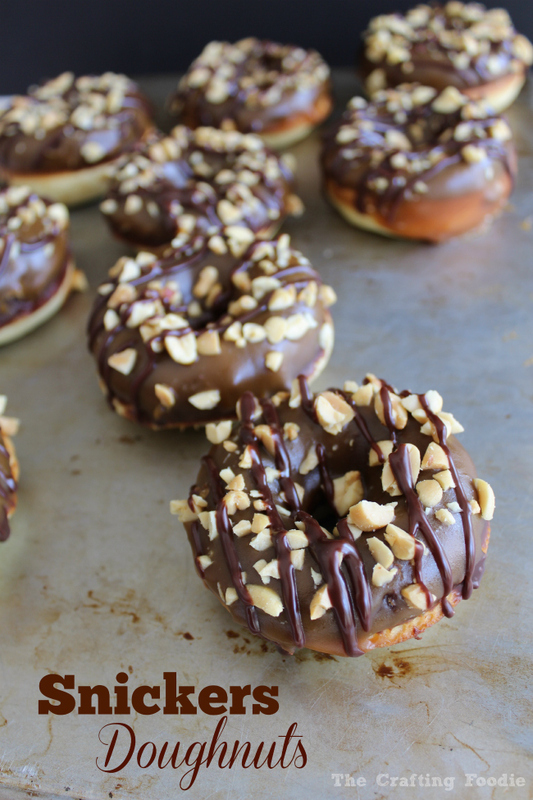 This is definitely the donut for this Snickers girl…. Holy yum! These look killer!! Thanks so much Stephanie! They were devoured! These are the tastiest doughnuts I’ve ever seen….yum! Oh my word. These are right up my alley! What is not to love about snickers and doughnuts?! Thanks, Meg! 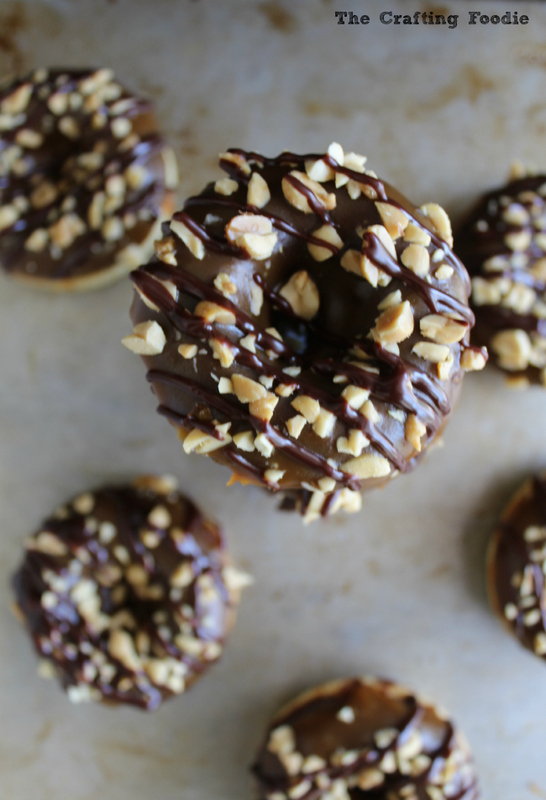 Yup – snickers and doughnuts. Nothing is better! I just purchased a donut pan, but have not used it. I guess I was looking for the right recipe. This is the one!